Toss all vegetables together with oil and salt. Place on two metal sheet pans. Roast vegetables at 400F for 25 minutes. Allow to cool. Add garlic oil* to 2 baking sheets, one for each crust. Mix the oil again and rub onto the two pizzas. 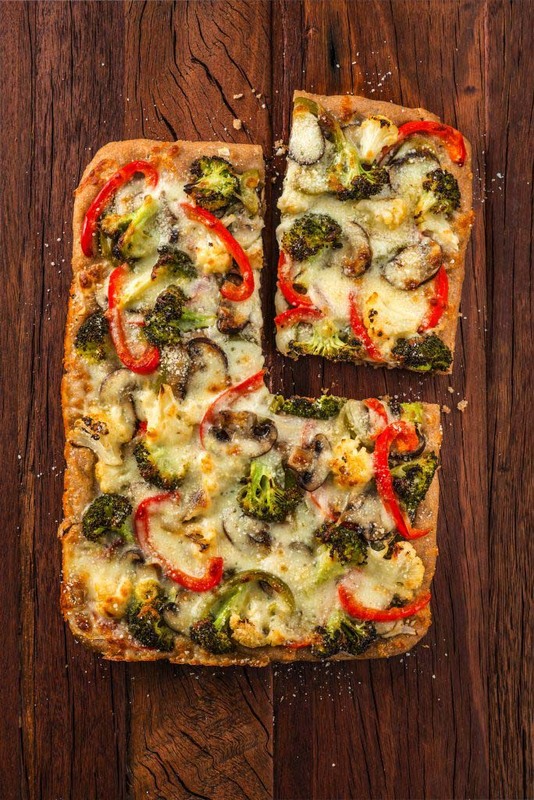 Divide the vegetables between the two pans and sprinkle with mozzarella cheese. Bake pizzas at 500F for 12 minutes. Remove from oven and sprinkle with parmesan cheese. *To make garlic oil mix together 1/4 cup of olive oil, 1 tsp. kosher salt, and 3 minced garlic cloves in a small bowl.